In my recent trip to India, I was in Connaught Place in Delhi. Close to the round-about, I saw a vendor selling books. I bent over to see all the books on display. And this book caught my eye. It was like I wasn’t looking for it but still have been on a quest to find it. It was based on the epic book of Mahabharat. I grew up in India and I have been surrounded by tales from my grandparents, from TV soap operas and even references to it in our festivals. However, never read it and was never convinced on the interpretations I was being offered. So, I believe I was in a search but wasn’t aware I was looking. I started reading it on my flight back and since then have squeezed in every moment to finish reading and have been feverishly underlining text in the book. It completely absorbed me. Gurucharan Das, in his book, “The Difficulty of Being Good“, offers a very compelling narrative on the evolution of the word “Dharma” and it subtleties. The book draws parallels to Aristotle, Tolstoy, Socrates which further enriched my reading experience since my knowledge was limited in their works. And the biggest take-away was the beauty in which it was all weaved together with views from modern philosophers. I believe the book requires a couple of reads to get the most out of it. Still, if Dharma as a subject that interests you, it is a must read. Gurucharanji has offered current day situations and juxtaposition of the same to Mahabharata’s making it amazingly pragmatic. To me, his personal quest in search of Dharma (he spent years studying the same under scholars at the University of Chicago), is inspiring too. 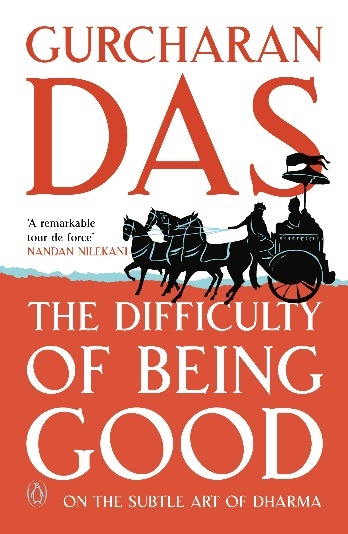 As corporate leaders in today’s world making tough decisions, competing, increasing share holder values on a daily basis, it examines difficulty of being good. Also, offers the distinction of “swadharma” (personal dharma) and “sadharana dharma” (universal dharma) to provide context to the dilemma. In conclusion, the book offers compassion as a key component in going through the ambiguity and complexity of life situations. I couldn’t agree more. It is not about the doing the right thing but doing it with compassion. Finally, an interpretation I find valuable. Thanks Gurucharandas ji! Must read and a life reference book. Enjoy. ← “I am really busy” Really?